I promise to all of my patients an open, compassionate discussion about all topics related to cancer and together formulation of the best individualized treatment plan. Dr. Eugene Ahn, MD, first dreamed of finding a cure for cancer when he was 5 years old. “My father was a hematologist/oncologist, and I always had a strong desire to improve our understanding and treatment of cancer,” says Dr. Ahn, Medical Director of Clinical Research at Cancer Treatment Centers of America ® (CTCA), Chicago, which is located between the Chicago and Milwaukee metro areas. Dr. Ahn earned his Bachelor of Arts degree in Biology at Yale University in 1993. He completed his Doctor of Medicine degree at the University of Miami in 1997. His postgraduate training, from 1997 to 2007, included a residency in internal medicine at the University of Utah, fellowships in infectious disease and hematology/oncology at the University Miami, and a National Institutes of Health-funded research fellowship in microbiology/immunology. From 2007 to 2014, he served as faculty at the same institution, and as Assistant Professor, he was the principal investigator on numerous clinical trials focused on improving the treatment of breast cancer and other diseases. His work is published in renowned journals, including Breast Cancer Research and Treatment, Clinical Breast Cancer and Genomics. In 2016, Chicago Magazine named him to Chicago’s Top Cancer Doctors list for Medical Oncology. In 2017, he was elected by his peers to a three-year term on the board for The Society for Integrative Oncology. Dr. Ahn recommends complementing conventional treatment plans with patient-preferred mind-body interventions to enhance immunity through innate biological pathways called “psychoneuroimmunology.” Research has shown that mind-body interventions enhance such conventional cancer treatments as surgery, chemotherapy or radiation therapy by improving dose tolerance and ability to complete therapy, quality of life and, in some studies, enhance cure rates. “Ultimately, I joined CTCA® because they have been delivering for decades this type of integrative care to every patient that is seen here, and I’m excited for the unlimited possibilities we can build here by continuing to offer and further innovate this integrative approach,” says Dr. Ahn. Licensed to practice medicine by the State of Florida and Illinois, Dr. Ahn is board certified in Medical Oncology, Infectious Diseases and Internal Medicine by the American Board of Internal Medicine. He will also serve as CTCA Chicago's Medical Director for Clinical Research (in Integrative Oncology) to enhance the clinical research portfolio at CTCA. He has particular interest in studying the most active ingredients of an integrative oncology approach. 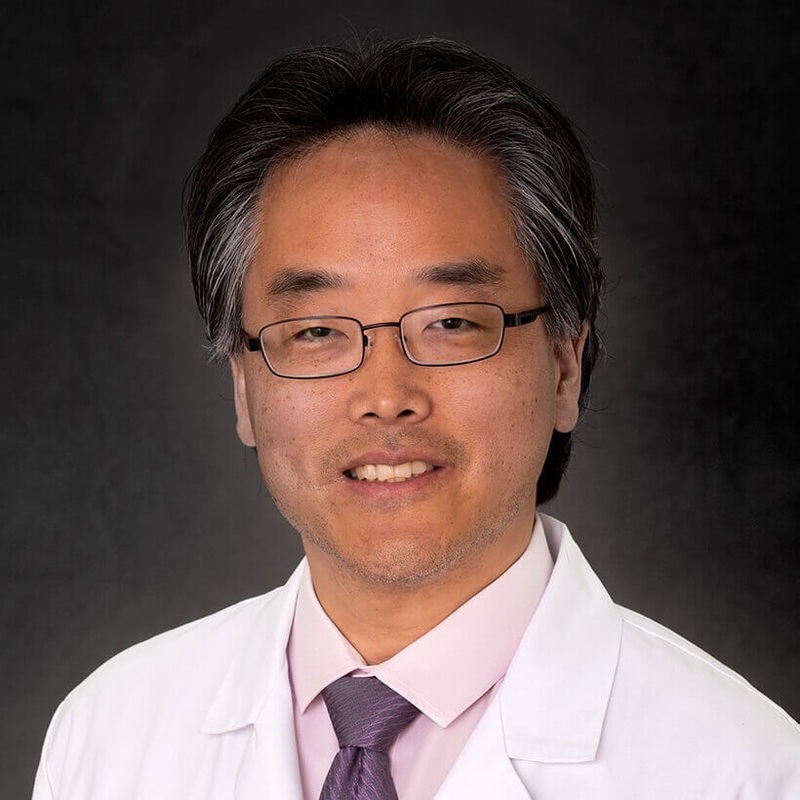 When he is not at CTCA, Dr. Ahn enjoys spending time with his wife and newborn girl, playing piano and guitar, and exploring the beautiful outdoors. "Dr Ahn was excellent and spent a lot of time with us." "I would recommend Dr. Ahn to anyone. He is great!" "only doctor I love and trust this much!" "I have a new oncologist, Dr. Ahn. And he is wonderful!!" "Dr Ahn is an amazing doctor. His knowledge of the disease is widespread. He is always well versed on any new treatment or studies that have come out. He always makes sure I understand the treatment and always answers every question." "Bravo Dr. Ahn. you are an amazing man. He spent time explaining everything. He truly cares for his patients. Thank you for being awesome." "very pleased with Dr. Ahn and his staff"
"Dr Ahn and [...] have been extremely helpful, professional and showing wonderful compassion, integrity, and professionalism throughout this journey. They are the best of the best! I could not be more pleased and confident throughout the process, only because of these two wonderful Physicians." "Dr Ahn is very straight forward and compassionate. He took time to be sure my feelings and daughters were at ease. He helped me understand options and his sense of urgency was great." "I love Dr. Eugene Ahn,my oncologist. He listens to me. I already tell everyone I know with cancer to go to ctca." "Dr. Ahn is a blessing & anything I send an email with a question or concern he and/or his team gets back to me promptly. I appreciate his concern." "Dr. Ahn is brilliant and compassionate." "My doctor is excellent! He always listens and gives great advice. He is very caring and dedicated to my treatment and well-being." "I always compliment CTCA on my care to others!" "personable and likeable. impressed with his knowledge and caring manner"
"Dr. Ahn is extremely caring and knowledgeable. I would highly recommend him." "Dr Ahn and I have had our differences. but I respect his medical opinion and knowledge. I feel I am in good hands." "We just love Dr. Ahn's bedside manner and his thoroughness. He tries to give us his time and answers our questions." "very caring, listens and answers all my questions." "My favorite thing about my Oncologist is his patience. He does not seem in a rush, and always has given me time to address every issue I have had." "I am almost finished with my treatments. I have been pleased with Dr Ahn from the beginning. He has been concerned throughout, giving me the time I needed to make decisions and answering my questions ( I had many). I am very pleased with the treatment I have received from him. I haven't been the easiest patient and for the most part he kept his patience with me. I am grateful to have him as my doctor." "Always talking and referring this wonderful place to others!" "Dr Ahn is a GREAT doc. his expertise and treatment options are well thought out and explained in a way that gave us confidence that he was on track giving us great care!" "Dr. Ahn is the ultimate Oncologist. I feel so comfortable with him. i"
"Dr Ahn is wonderful!! Very caring, thorough. takes time to talk about concerns and questions. I trust him completely. I would recommend CTCA and Dr Ahn to all." "Dr. Ahn is top notch. I have never had so much confidence in a doctor." "*Dr. Ahn answers all of my questions and is kind & compassionate. I don't always feel like getting individualized treatment. I didn't feel like I was believed when I described my post [...]symptoms." "the comfort and security I have and believe in this facility, and ALL the staff. the peace of mind this place gives us is unbelievable. words just can't describe." "Dr. Eugene Ahn is a wonderful, intelligent sweet man. I would give him a 20 if I could." "Dr Ahn seemed extremely competent, knowledegable and supportive." "Dr Ahn has accommodated my requests and I appreciate that. I believe he is very knowledgeable in the field of cancer." "Dr Ahn seems knowledgeable, approachable and available for questions between visits"
"Dr.Ahn is the most caring doctor ive ever had. he explains everything and really takes his time during your appointment to make sure all questions have been answered." "Dr. Ahn is very nice"
"Dr. Ahn and [...] ..were quite thorough. They had awesome bedside manner. They answered questions, got back timely, they are compassionate, concerned, and caring and they communicated honestly! This was my 1st hospital experience and they went over me like I was a treasure to insure EVERYTHING was ok...not spot treatment." "*Dr. Ahn is the best! As we said in our letter, his kind - compassionate & professional approach - made us feel so - safe & we knew we would be cared for in every way - His assistant [...] is excellent as well. - All of their staff are awesome as well. We love coming & know it's the best place for us to be! #1. Excellent. #2. Have already." "I cannot speak highly enough about my doctor. *Dr. Ahn is amazing. He stood up for ME. I have never seen a place like this before! I have the BEST "dr."." "He has stood by me through all treatment. Concern, kindness, and patience has far exceeded expectations. i came to CTCA because of Dr Ahn." "DrAhn has an amazing way of making me feel like family, like he really does care for me!" "Dr Ahn was very thorough sat with us for as long as necessary answered our questions and gave alot of information that I needed and that helped me make my decision to begin treatment"
"Dr Ahn is phenomenal. He is the reason I come to ctca." "My Oncologist was the one who gave me the most confidence, information and direction. I did not feel like I was "part of a study" or "Just another breast patient" or "low risk, low attention". His attention to my case was evident in the answers to my questions. . . they were not generalized or maybe's because he did not read my file. He did know the details -- that was important." "Dr. Ahn is fantastic, extremely knowledgeable and compassionate." "Dr. Ahn is an outstanding doctor... patient, great listener and always up on the latest research data. Is able to communicate medical information in an understandable way without talking down to the patient"
"My oncologist was not only very personable, got to know me and recommended a treatment plan for me, but was knowledgeable in the latest treatments, what would work for me and worked with others in my care team to get me the best for my cancer." "I trust Dr Ahn completely. I moved to CTCA because he moved there"
"Dr Ahn is great and [...] along with Care Management team"
"Dr. Ahn, is the best"
"Dr. Ahn is such a caring doctor - he makes you feel like you are his only patient and your care is his number one priority." "Dr. Ahn is freakin' AWESOME ! This coming from a girl who refused conventional therapy from [...] ' till I met him, and requested starting as soon as he could arrange it (which was [...] days later... before returning home)"